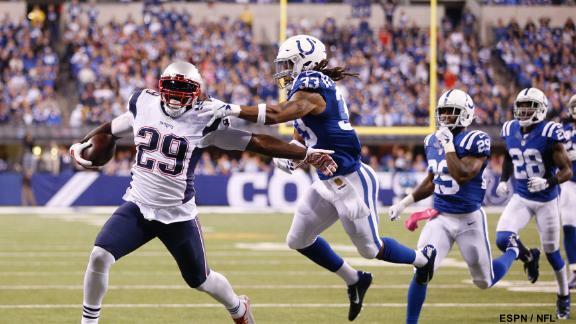 The New England Patriots did not compile as many total rushing yards as in recent matchups against Indianapolis, but running back LeGarrette Blount tramples the Colts every time they meet. The Patriots tailback averaged 5.8 yards per carry and, as Brian Filipiak explains, recorded his longest gain on the ground this season thanks in large part to textbook blocking on a power run. 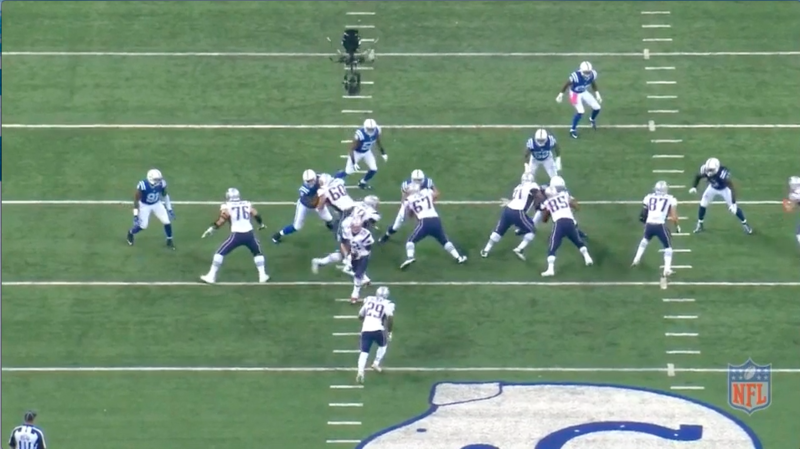 As we highlighted leading up to the game, New England has used the one-back power concept to feast on the Indianapolis defensive line at the point of attack. Although the Colts newly revamped run defense has shown signs of improvement this season, the Patriots and LeGarrette Blount provided them with a flashback to last year’s AFC Championship Game early in the second quarter. In an effort to flood the playside with as many blockers as possible, left guard Shaq Mason (#69) pulls, leading the way into the intended hole. Right guard Josh Kline (#67) secures nose tackle David Parry (#54) with a down block while tight end Rob Gronkowski seals off outside linebacker Erik Walden (#93). While the blocks all serve their purpose, the ones in between Kline and Gronkowski provide Blount with the room he needs. Right tackle Cameron Fleming (#71) and tight end Michael Williams (#85) execute a combination block on defensive end Kendall Langford. First, Fleming leverages the defender toward his teammate, which allows Williams to take over the block at a better angle and eventually drop Langford to the ground. From there, the right tackle slides off the double-team to the second level, where he meets inside linebacker Jerrell Freeman (#50). Blount to bursts through the hole with a small convoy of blockers leading the way. Mason demonstrates good footwork and balance as he slips past the line of scrimmage to pick up inside linebacker D’Qwell Jackson (#52), who has placed himself in poor position to take on a road grader. Meanwhile, cornerback Greg Toler (#28) is slow to react in run support. 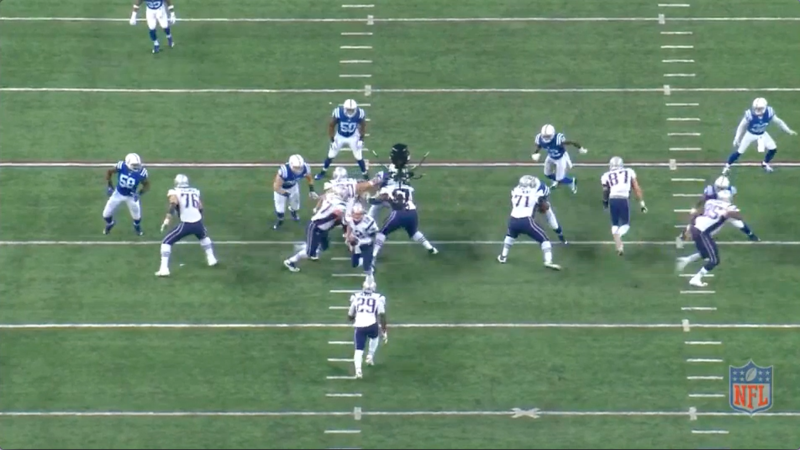 As Blount passes the linebacker level, he receives help from wide receiver Julian Edelman (#11) in the open field. Safety Mike Adams (#29) appears to initially mistake the run for a play action pass and focuses on the receiver. Edelman doesn’t lay a finger on Adams, but he gets in the way just enough. Blount jab stabs left to misdirect the defender before slicing back to the right, blowing past Adams for a 38-yard touchdown run. Blount reads and sets up his blocks extremely well on the play. The designed hole appears to be between the tight ends (D Gap) with Mason as the lead blocker. But the running back displays good vision, sighting Jackson in the hole and turning the run inside toward the vacated area initially occupied by the linebacker. Biting hard on the fake handoff and/or blocking action, the Colts inside linebackers (Freeman and Jackson) take several false steps toward the line of scrimmage, leaving the middle of the field completely empty. Brady has an easy read, a clean throwing lane, and a wide open window between the out of position linebackers and deep safety. Whether it’s running to set up the pass, or passing to set up the run, New England’s execution – and deception – on the above two plays all started up front. And like they have in their previous three meetings, the Colts once again fell victim to big plays from one-back power runs and the play action off it.